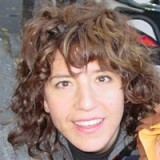 Erika Svendsen, New York City. As a Brooklyn (New York) resident for over 15 years, I’ve never thought much about whether or not I was living on high ground, within a floodplain or an evacuation zone, or how I might secure my windows during a storm. Recent hurricanes in my city have changed my perception of where I live and, ultimately, the places that have meaning in my community. As friends and neighbors gathered in my Carroll Gardens apartment to shelter in place during last October’s Hurricane Sandy, we enjoyed conversation and good food. Our children, delighted by the novelty of the event, made up endless games and watched more than their typical allotment of YouTube videos. Around midnight, a friend stopped by our apartment on her way home from her job in Manhattan. I used this excuse to go outside to check on the large London Plane trees that have long surrounded my neighborhood park. Despite the wind and rain, I could see the large, ominous forms of trees on the ground. I retreated back upstairs. The next morning, my friends returned to their house in Red Hook to survey damages. I took the kids out for much-needed fresh air. The park was filled with similar groups of slightly bedraggled parents alongside energetic youngsters eager to return to outdoor play. Things in the park had changed. 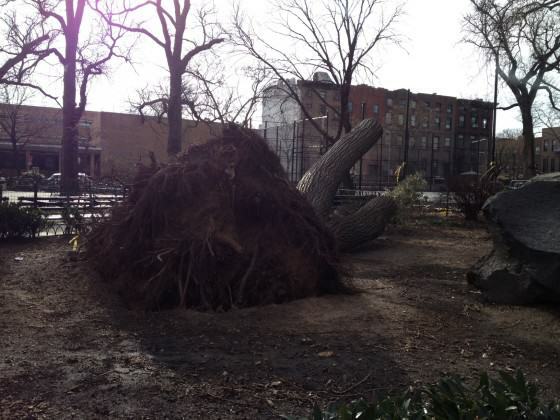 It was strewn with tree limbs and there was significant damage to the play courts. Several old trees had crashed to the ground. Wrought-iron and chain link fencing was crushed. As we followed the length of one downed tree, it led us out of the park and across Carroll Street where its upper trunk came to rest on a parked car and its canopy blocked the entrance to a stately brownstone. There were several people surveying the damage. I was struck by their silence. Suddenly, one of my young charges squeezed through the line of onlookers, inspected the remains of what was once a fancy, red sports car, and proclaimed loudly, “Sheesh, I’m glad that wasn’t our car!” Laughter ensued. We continued along what was clearly a spontaneous pilgrimage to all of the fallen trees in the area. Street trees. Park trees. And then we come upon one of the most significant sites of tree loss. For decades, this stately little leaf linden tree stood in a corner of the park, in a small gated area ringed by flowering shrubs. 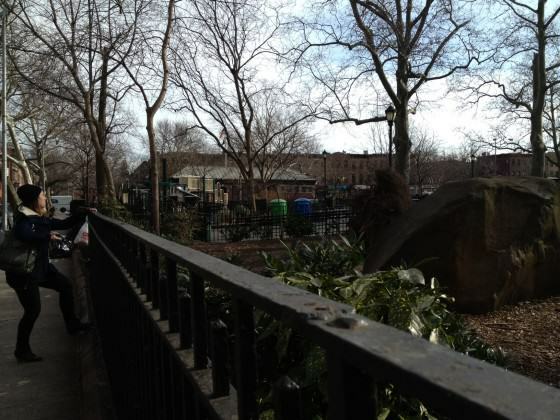 It stood in an area adjacent to basketball courts, benches and a water fountain. The tree’s presence, next to a large boulder, invited a different experience for the park user: one that was more peaceful. Young parents brought their toddlers here to quietly sit upon the shaded rock. Groups of school-aged children often scrambled atop the rock to share secrets or engage in free play in the slightly more subdued place. At dusk, teenagers typically positioned themselves here to look out for friends or spend time talking. Early risers have used this spot to stretch, meditate and greet the morning sun. At the base of this fallen giant, someone left a bouquet of flowers still encased in plastic wrap from a corner deli. I wondered whether this was the same bouquet I noticed over the weekend at the base of a temporary memorial in the park. Perhaps the wind had blown this small offering around and another person had decidedly placed it at the base of the fallen park tree? Or were the flowers meant only to commemorate the tree? What seemed to matter most was the connectivity between the two events. Humans use nature as symbols—typically rocks, trees and gardens—to celebrate life and to mourn death. We convene around these symbols to mark the passage of time. Here, the tree, or perhaps this former union of rock, tree, and human, was the object of our memorialization. Amidst the grave destruction of human life and property, someone paused to mark the tree’s death. Working for the U.S. Forest Service, I have become acutely aware of cycles of disturbance and resilience. When a forest burns, there are winners and losers among the flora and fauna. Some creatures lose nests or burrows, feeding or breeding grounds. Others flourish as they gain space, light and air. Disturbance is part of life in the woods and, ultimately, we never walk the same forest twice. The quality of resilience often depends upon time and conditions before any disturbance. Having worked as an urban forester and now a researcher of the urban forest, I revere the way in which individuals and groups often embrace nature after a significant disturbance. In many cases, ‘nature’ was the very thing that destroyed lives, homes and communities. Hurricanes. Ice Storms. Tornados. Floods. After each of these disturbances, there is recovery. Consider your own experience with such events. After the emergency responders have moved on, someone inevitably calls for the need to plant a tree, build a garden, or reclaim a piece of the shoreline. Often, these humble expressions have served to remind us that the most vulnerable people often live in the most fragile places, made worse by social segregation and environmental degradation. And even after ‘not-so-natural’ disasters, as in the case of the September 11th terrorist attacks, we’ve witnessed hundreds of individuals and groups decide to plant trees and create living memorials that stand not only in remembrance of those killed, but of the universal bonds between loved ones and communities. For decades, we have seen this same, patterned response of emergent stewardship from people living in urban areas where populations have declined, housing has deteriorated, and employment has waned. In these forlorn places, we have seen the rise of vibrant community gardens, pocket parks, window boxes, tree lots and the like. It has been my experience as a researcher delving into human motivations of urban stewards, that many of these acts evoke the spirit of the forest. No matter how humble or small, these efforts loom large in the cycle of disturbance and resilience. At some point along the path of recovery, we can lose sight of the importance of these actions. We tend to focus on more instrumental or utilitarian questions such as: What can nature do for us? How much is a tree worth? How much can our wetlands and green streets absorb to save our homes and businesses from flooding? This type of thinking is entirely reasonable when one realizes that yes, as humans we are part of nature. And, as humans, we are the only species that can rise to a level of abstraction to actually do anything about the long-term stewardship of our ecosystems. Thankfully, there are researchers, policy-makers and citizens working hard to help address these questions but we might consider there are some answers that are quite clear. Earlier this spring, I had the honor to introduce a special lecture on ‘The Benefits of Urban Trees,’ by U.S. Forest Service scientist, Dr. David Nowak. The lecture was part of a series to celebrate the release of a vibrant, new book of photography by Benjamin Swett, entitled “New York City of Trees.” As I prepared my introduction, I found it remarkable that both scientist and artist had found profound, but strikingly different ways to value and understand the urban forest. Dr. Nowak’s i-Tree model has been used by hundreds of cities throughout the world to quantify the environmental benefits of urban trees. These benefits include cooler air temperatures, air pollution removal, carbon storage and household energy savings. Mr. Swett, on the other hand, presents the urban tree as a ‘keeper of the city’s past.’ He depicts trees as part of the collective memory through a mix of personal stories, historical events and artistry. In one account of a massive Eastern Cottonwood in a corner lot on Staten Island, the reader learns this tree has meaning that spans generations in the community. The tree’s great expanse triggers memories of a parent, a grandparent, a house. Memory continues to shape place and purpose. I was reminded through these two distinct works how fortunate we are to have both artist and scientist value the urban forest, creating varied lenses to understand the essential relationship between rock, trees and humans. As the audience awaited Dr. Nowak’s top benefit of the urban forest with great anticipation—(Hint: think temperature)—I was pondering the number two benefit of our urban trees: aesthetics and social benefits. Nearly all of the benefits, including temperature, had certain values listed. But why were aesthetics and social benefits marked ‘uncertain’? Isn’t this value universally known? Hasn’t it stood the test of time? I think it’s fair to surmise that when my neighborhood tree fell down in Carroll Park, residents did not immediately mourn the loss of a few dollars in home heating and cooling bills. Nor is it likely that they lamented its capacity to absorb water and carbon. It is not to suggest that these benefits are not important, but only to have us reflect on the idea that quantifying and qualifying the loss of this tree is dependent upon one’s frame of reference. 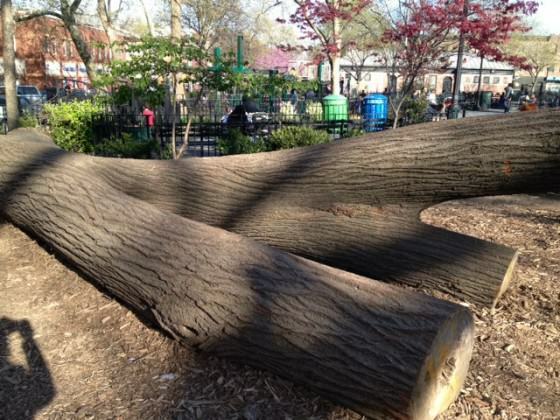 At the scale of an energetic five-year-old and a parent wanting to escape the confines of an average sized, two-bedroom, Brooklyn apartment, we mourn the shade this tree provided as children spent endless hours climbing the rock beneath its branches and playing with twigs near its base. We’ll miss the cool haven it provided during the hot summer months. I know that many will recall the dappled sunlight and the brilliant, colorful turn of its leaves each fall. And we will be forced to find another way for rock, tree and humans to interact to create a seemingly ordinary but decidedly sacred space. In this way, we know what this tree was worth in terms of social benefits to the surrounding community. When we look to the long arc of history, we can understand social value even further. In the writings of our greatest philosophers and work of acclaimed artists of all kinds, we find inspiration from nature. In the speeches of world leaders, we hear language that acknowledges the interplay between nature and the quality of human life. In the actions of those engaged in social movements and acts of resistance, tree planting and reclaiming nature has become an effective ‘weapon of the weak’. We tend to reduce these acts to gestures, moments, stories or fleeting shouts in the street. But they are more than that. 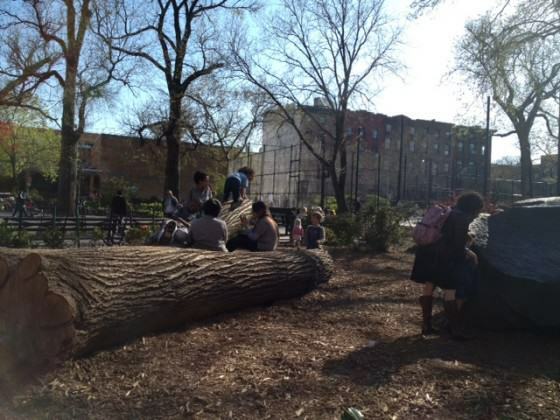 When we discover the true value of urban nature it is social and it is transformative. It becomes the place from where we may set a course of change and discovery. Do we need to quantify what exists before our own eyes? Back in Carroll Park, there is an active group of park volunteers. 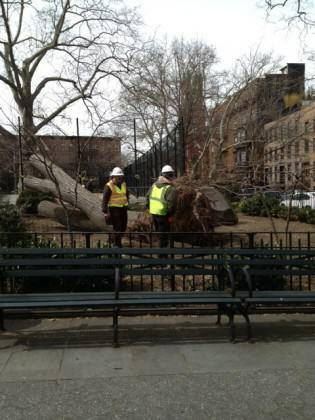 The storm’s aftermath has sparked a great deal of activity in terms of clean ups and repair. I’m not certain who led the decision to leave a significant portion of our downed tree alongside the rock or even what exactly they had in mind in doing so. I do know that many of my neighbors have whispered in passing, “I hope they leave it on the ground.” In my own wanderings around the park, I’ve observed a wide range of people, young and old, pause to admire the downed tree. Neighborhood children delight in touching it, climbing it and being in the company of this old friend. We never experience same forest twice, as both people and place are constantly evolving. Carroll Park is different, post-storm. My perception of it has changed, as I have changed, deepening my understanding of public space and human agency in the recovery process. Somehow park volunteers and managers did more than repair the park, but improved it as they created opportunities for the public to experience the reciprocity of nature. In a dynamic and ever-changing urban environment, they sustained and strengthened a place of social meaning. Not unlike our vast wilderness areas in the American West, our urban forests have much to teach us not only about disturbance, but about what constitutes resilience. I’d like to acknowledge the dedication and care of the Friends of Carroll Park in their stewardship of a precious community resource. I’d like to thank Mary Northridge, Sara Metcalf, and Denise Hoffman Brandt for their recent conversations that have inspired many of these ideas. And thanks to my young friend, Shane. All photos are by Erika S. Svendsen.